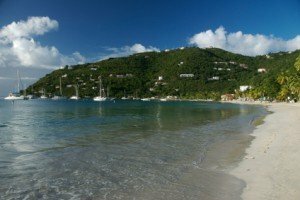 One of the most popular kinds of crewed charter sailing vacations in the British Virgin Islands is the Scuba Charter. 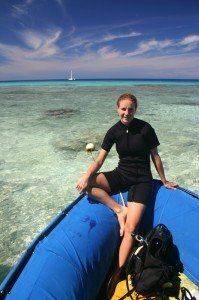 Crewed Sailing or Power Boat vacations that take you to great scuba diving spots and show you wonderful diving. The area around the four jagged rocks that make up “The Indians” is packed with large mushroom coral heads and lush, soft coral gardens. Marine life abounds in the coral folds—schools of Creole Wrasse and Blue Tangs scurry by while lobsters, Spotted Drums and Fairy Basslets hang out under the corals head. The gap between the four Indians and a fifth, hidden Indian forms a mini canyon, and the vertical walls of the rocks themselves are encrusted with hard and soft corals and sponges. On the eastern side, a shallow “fish bowl” (ideal for snorkelers) conceals a narrow tunnel and a small cave filled with Glassy Eyed Sweepers. Reef sharks are seen here from time to time. The RMS Rhone was anchored here in the mouth of Great Harbour, Peter Island in October of 1867 while she took on fuel, supplies, and passengers for the journey back to England. When a hurricane blew in, the massive anchor and its 300 feet of chain were lost at this spot where they remain to this day, coral-encrusted and half-buried by sand. Dive down to this historical jewel and see the ship in all its ghostly glory, along with the wildly-diverse marine life that has made the boat their home. What’s the best way to pack for your crewed charter yacht vacation in the British Virgin Islands? Pack light! Most of your days you will be either onboard sailing, at anchor, on a mooring or travelling in the dinghy to go snorkeling on a beautiful reef or ashore to a beach. In some places you can swim ashore to a local bar for happy hour. For a typical 7 day charter you would need 2 or 3 swimsuits, t-shirts and shorts, a pair of casual long pants or dress for going ashore to eat or shop. You will only need flip flops or boat shoes (no dark soles allowed) or shoes to go ashore in. Remember, clothes can get wet or splashed so leave your treasured t-shirt or hat at home. A cover-up is essential. While on-board, swimsuits are OK, but when ashore some places request more modesty and so cover-ups will be required. Your sailing crew will advise as you go. Remember you are going sailing so it is quite likely that your hats will fly overboard, so bring at least 2 or invest in a clip to secure it to back of your shirts. Bring a sweatshirt and light raincoat for cooler evenings and choppy seas in the dinghy. Sunscreen and after sun care is a must. We consider SP15 only a moisturizer here! If you do not want to be burnt, bring minimum SP 30 and oil-free only please. Remember to use it on your feet too. The non-perfumed sunscreen is the best. Oils are not allowed on yachts. Zip lock bags are great to keep money and personal gear dry for swimming ashore to bars and beaches. They are easy to pack and extremely useful in a wet environment. Batteries and disposable cameras are quite expensive in the BVI so bring them with you for capturing those fish underwater. Finally, soft luggage or luggage that packs flat is the best for stowing away in your cabin or locker as space is at a premium onboard most yachts. What is a “bareboat” Yacht Charter? How Is It Different from a Crewed Charter? By Kathy Corbett|2019-01-24T03:58:15+06:00October 23rd, 2011|British Virgin Island Yacht Charters|Comments Off on What is a “bareboat” Yacht Charter? How Is It Different from a Crewed Charter? What is a Bareboat, this is a vessel ( yacht) that can be chartered without a captain or crew or provisions. The charterer needs to be a qualified Captain with sailing experience. Dynamic Charters BVI specializes in “Crewed” yacht charters. These are yachts that have a captain and first mate (and additional crew depending on the size of the yacht and number of guests) onboard. Crewed chartering brings new meaning to the words “getting away”. Perfect for families, friends and even corporate retreats. The British Virgin Islands are a paradise of hidden treasures and there is something for everyone. From total seclusion to the wildest party spots, and everything in between, the British Virgin Islands’ 60 islands and islets, have it all.